Our scale models of Tristan's traditional wood and canvas longboats are usually made to order and are available in a range of sizes. 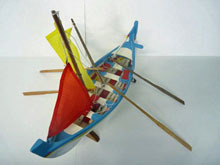 Left: A miniature hand-made traditional Tristan longboat. The size is approx 18cm long by 16cm high when rigged, and it is priced at £41.00 including post and packing. available direct from the island. 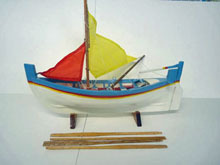 Three views of a medium sized Tristan da Cunha model longboat with four oars. 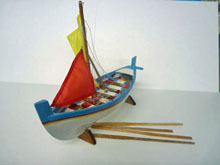 We offer a bespoke model longboat making service. These models are sought after, and normally sell direct to island visitors. Therefore we have launched a scheme for customers to order a longboat to their own specification within a range of available options. On receipt of your instructions we will commission a named Islander to make your boat. Then we will provide a total price including post and packing, and an estimate of when the model can be dispatched. You then confirm the order, make payment and the model will be constructed, packed and dispatched. We will confirm each stage of the process and can arrange a photograph of the model being constructed on request. Dimensions are approximate (+/- 2 cm) and will be confirmed. 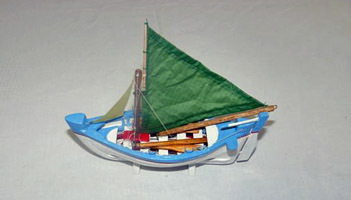 Model makers will paint stripes (see models above) according to their own boat specification (see above). Sails are currently red, yellow, blue or white using two contrasting colours to be confirmed. Traditional skills to provide you with a unique and authentic Tristan-made souvenir. 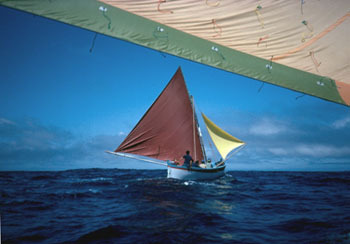 Above: Left: A longboat in full sail en route to Nightingale Island. 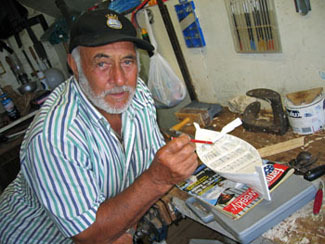 Right: Lindsay Repetto putting the finishing touches to a replica model longboat.